Native to the Pacific Northwest the Indian Plum is a perennial deciduous shrub with soft lime green leaves in spring. 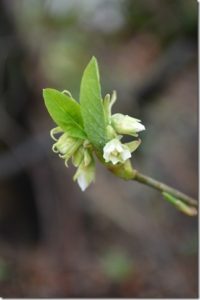 I have always heard that this is our earliest blooming spring plant native to the Pacific Northwest lowlands and it is my indicator plant for the start of spring blooms. While anyone that follows my blogs knows I can find nectar or pollen producing plants just about any day of the year in city neighborhoods, it is much harder to find native plants that are blooming this early. The Indian Plum is a nectar producer and can tolerate a variety of soil conditions from slightly shady damp areas to dry sunny spots. Sunnier spots will help them bloom more aggressively. They can grow relatively easily from cuttings or seeds and become 16 feet tall with most around 6-8 feet. In addition to the nectar producing flowers that attract a variety of pollinators it produces small purple fruits “plums” in fall that many animals eat. While these shrubs are not very compact in shape they can still make for a nice addition to our woodland gardens.